John Higgins became the first player to win five Welsh Open titles with a 9-7 victory over Barry Hawkins in Cardiff. Higgins adds to his Welsh Open wins in 2000, 2010, 2011 and 2015 with the 30th ranking event victory of his career. The final was played to a much higher standard than the semi-finals with both players producing century breaks. “It feels great, that is one of the most enjoyable finals I have ever played in, the standard was great,” Higgins told BBC Sport Wales. “Barry could have won and I would have had no complaints because it was a great game. Higgins had the opportunity to win a record fifth Welsh Open title and the £70,000 winning purse after beating Gary Wilson 6-2 to reach a seventh final while Hawkins beat Noppon Saengkham 6-4 in the other semi-final. 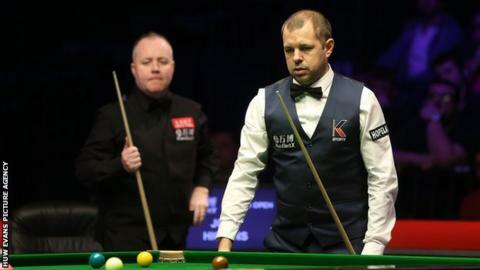 The opening session ended level after Higgins came from 4-2 down to level the match at 4-4. Hawkins won the opening frame but Higgins responded superbly with a 138 clearance to level, with Hawkins pinching the third before another brilliant break from Higgins who rattled off 141 to make it 2-2. A scrappy fifth went to Hawkins and a run of 130 put him 4-2 ahead. Higgins levelled at the interval by edging two close frames, a feat he repeated at the start of the evening session to move 6-4 ahead, before Hawkins rattled off 103. The break building from both players was excellent and Hawkins did it again in frame 12, with a dazzling 138 break earning parity at the mid-session interval. A run of 66 allowed Higgins to creep 7-6 ahead, before a nervy exchange saw Higgins move 8-6 in front after both players missed shots with only pink and black remaining. Hawkins kept his nerve as a run of 82 made it 8-7 and a 64 break meant he was always in control of the final frame. “I tried everything,” Hawkins said. “I threw everything I had at him and still couldn’t beat him, that says it all.